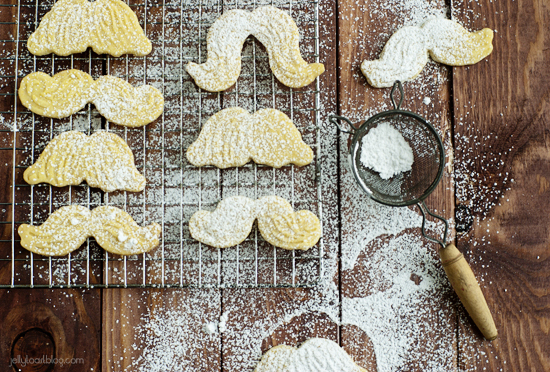 That’s right, a manly mustache cookie for the jolly guy in red. I’m not totally sure how the whole ‘mustache’ phenomenon got started in our house, but for a couple of years now, the Buddy has been completely amused with mustaches. On anything. In fact, on our Wii he added a mustache to his Mii character and even went as far as to add a total Fu Manchu stache on the Baby’s Mii. It’s weird to see my 3 year old daughter in a mustache. Hilarious, but weird. (5 different ‘styles’ with mustache texture stamps on the back…seriously) as a gift from his cousin. Needless to say, he was thrilled and we have been making manly cookies every since. We even enjoy a mustache shaped sandwich with a side of milk from time to time. 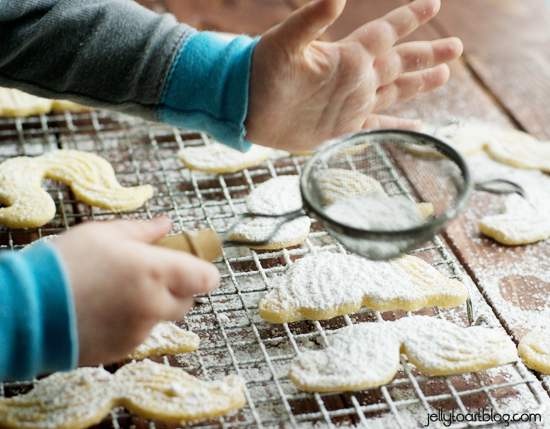 Anyways, this year when the topic of which cookie to make for Santa came up it seemed like a great idea to make a big batch of Santa ‘Staches. 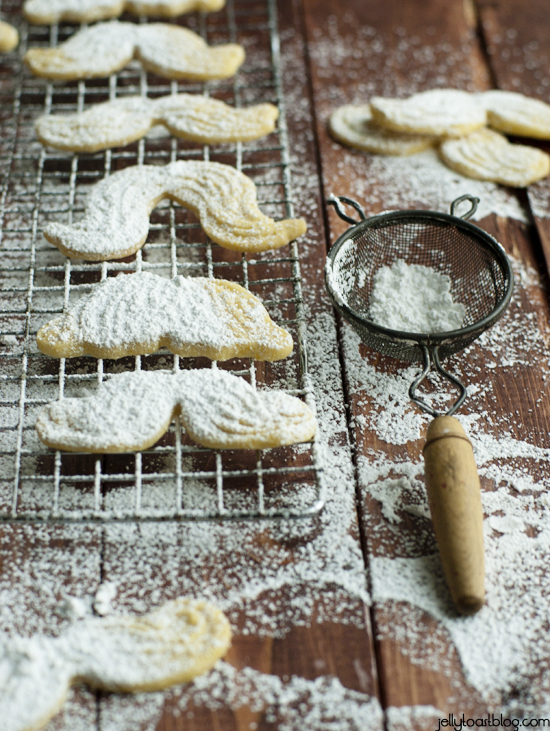 I found this lovely recipe for lemon cornmeal sugar cookies and adapted them to fit our mustache needs. They have a delicate texture with a bit of crunch from the cornmeal and a lemony brightness that makes them truly addictive. 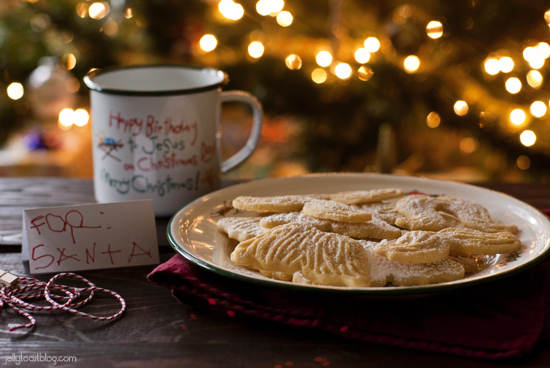 And with a little sprinkle of powdered sugar, these little tributes to Santa turned out a beautiful snowy white. I guess technically, they are still a little lemony colored, but I have no problem getting heavy handed with powdered sugar. What’s Christmas without a little extra snow? I think Santa will be pleased. 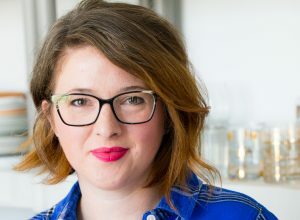 In a medium bowl, whisk together flour, cornmeal, cornstarch and salt. Set aside. Using an electric mixer, cream together butter, sugar, vanilla and zest until light and fluffy. With the mixer on low, gradually add dry ingredients. Increase speed to medium and mix until a soft dough forms. Divide dough in half and shape into discs. Wrap each disc with plastic wrap and refrigerate for at least 30 minutes or up to overnight. Preheat oven to 350 degrees, with the oven rack positioned in the middle. Line baking sheets with parchment paper, set aside. Remove dough from fridge and on a lightly floured surface, gently roll out dough until it is 1/3 inch thick (if dough was chilled overnight, allow it to sit at room temp for about 10 minutes before rolling). Using a lightly floured cookie cutter (whichever shape you like), cut out cookies and place them on prepared baking sheets. The dough is fairly delicate, so a thin metal spatula is helpful for transferring cookies to the baking sheet. Bake cookies for about 12-14 minutes or until just golden at the edges. Allow the cookies to cool on the sheets for 5 minutes, and then transfer them to a wire rack to cool completely. 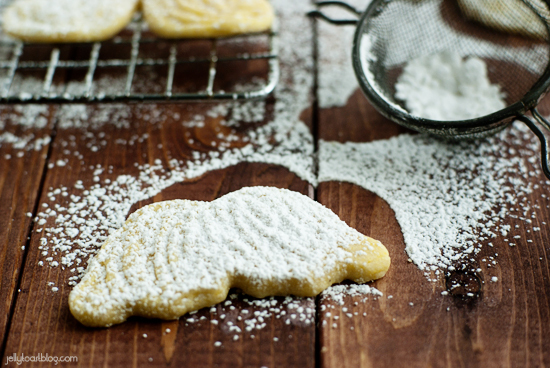 Dust cooled cookies with more powdered sugar and serve. I just stumbled onto your blog thanks to tasty kitchen and found it completely necessary to tell you how absolutely adorable these cookies are; although, I’m sure you already know. hehe. have a very merry christmas! I’m so glad you found me! Thank you so much for your kind words! Have a happy New Year! Those are crazy adorable! And the photos are gorgeous!